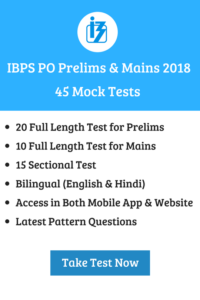 IBPS PO Prelims exam is scheduled on 13th, 14th, 20th and 21st October 2018. While the candidates are filling an online application, ensure to check previous year cut-off. This will give an idea about this year exam. So, candidates can know the minimum qualifying marks that are required to clear the exam. As we know there is the introduction of sectional timing on prelims, so cut-off marks can be expected this year. Institute of Banking Personnel Selection Board has released IBPS PO notification with 4252 vacancies. The vacancy has increased than comparatively last year. Initially, to start online application process check previous year IBPS PO cut off to know how the exam was. This IBPS PO Cut Off will give a fair idea about the upcoming IBPS PO exam. Apply online link for IBPS PO will be active from 14th Aug 2018. There are sectional timing added in IBPS PO Prelims 2018, so this year we can expect IBPS PO cut off for Prelims Exam too. What is IBPS PO Cut off 2017-18? IBPS PO Cut off will be announced for each level (Prelims & Mains). IBPS PO Cut off 2017 has been prepared based on the category and the availability of vacancies. The IBPS PO Cut off 2017 will be fixed only by the authorized IBPS exam Board. The candidate who applied for IBPS PO should obtain the minimum of IBPS PO cut off based on their category only considered as passed the level. Candidates stay focus on your studies and do subscribe us to get more informative ideas for crack IBPS PO Exam. Apply online link for IBPS PO will be active from 14th Aug 2018. There are sectional timing added in IBPS PO Prelims 2018. So this year we can expect IBPS PO cut off for Prelims Exam too.